Each frame is .1 second apart. It is not known at what stage of the race these pictures were taken. Ian Thorpe's time in this event was 3:49.64. Ian Thorpe has performed extremely well winning Australian Age-group Championships in all events. His crawl stroke performances are far better than any recorded at this age. He is coached by Doug Frost at Padstow, a suburb of Sydney, Australia. The Padstow club trains in Doug Frosts' private six-lane 25-meter pool. Ian's sister Christine has represented Australia in distance events. As well as the two Thorpes, Doug Frost has also produced recent Australian representatives Brooke Townsend and Philip Bryant. Some readers of this analysis will want to attribute to it a concept such as "an overtaking stroke," or "front-quadrant swimming." Such characterizations are nonsensical. One of the major factors governing individual style is a swimmer's physical attributes. Technique differences between champions are usually determined by the necessity to accommodate peculiar physical dimensions while adhering to basic mechanical principles. In the case of Ian Thorpe and Grant Hackett (see Hackett's separate analysis), both are physically immature, exceptionally tall, and highly ranked in distance events. A problem that confronts tall, thin distance swimmers is the difference in duration between the recovery and propulsion phases, the former being much shorter than the latter. These two examples show that a fast recovery is made, probably to reduce the time that its vertical forces are influential in the stroke. In Ian Thorpe's case, the duration of arm recoveries is in the vicinity of .3 seconds for the right arm and .4 seconds for the left arm. However, the time spent by both arms in the propulsive phase is much longer and so the recovered arm "has to be put somewhere." The end of the recovery consists of stretching forward long and straight under water while the other arm completes its propulsion. This movement is not made to "reduce resistance" or to "enhance streamline." It simply is done to accommodate the length of time this shape of swimmer takes to complete propulsion. It is positioned in the water to minimize the transitory added resistance that results from increasing the wetted surface of non-propulsive surfaces of the swimmer. Swimmers of different shapes and physical proportions might not be required to perform with this restriction. Frame #1: The left arm enters with the upper arm, elbow, and top portion of the lower arm preceding the hand and wrist. The right arm propulsive phase is at the end of upper arm adduction and changing to elbow extension. The left leg begins to kick to counter-balance the latter part of right arm propulsion. The body is well streamlined. The face looks forward preparatory to turning to breathe. Frame #2: The left arm extends fully forward near the surface with the hand flat. The left shoulder is fully elevated to accommodate maximum length forward and to reduce frontal resistance. The right arm continues propulsion by extending at the elbow and keeping the hand deep and vertical. The left leg kicks. The head rises and turns to the right. The streamline of the body and thighs is maintained. Frame #3: The left arm is extended forward and starts a very subtle press downward. The right arm continues propelling long and deep with a vertical hand. The head is raised and completing its turn to the right. The left leg kick is near completion. Frame #4: The left arm continues its subtle press downward. The right hand exits the water and the head is turned to the right preparatory to breathing. There is no obvious propulsion at this stage. The right leg kicks to counter-balance the left arm press and assists the hips and shoulders turning to the right. Frame #5: The left arm begins to re-position to create propulsion. The left wrist flexes, the elbow bends, and the upper arm is medially rotated. Some of the early vertical force component of the left arm movement is used to counter-balance the vertical force component of the recovering right arm. The right leg completes its kick while the left leg is raised preparatory to kicking. Inhalation in the breathing action is completed. Frame #6: Very rapid re-positioning of the left hand/forearm occurs while the upper arm remains medially rotated and extended forwarded. This is an extremely desirable "elbow-up" position as it sets up a movement that will produce a maximum-length effective pull. The left leg begins to kick to counter-balance the very fast right arm recovery. The head has returned to look directly at the pool bottom. Frame #7: The left arm propels the swimmer mainly because of upper arm adduction while the hand/forearm propulsive surface is close to a right angle to the line of progress. The right arm has entered after its very fast recovery (approximately .3 seconds). Streamline is maintained even though the head looks slightly forward. The left leg continues to kick. The right leg rises preparatory to kicking. Frame #8: The left arm continues its long effective pull. The position of the arm has changed mainly because of continued adduction. Since that movement rotates around the left shoulder and the left leg kicks the hips and shoulders are rotated away from facing to the right and are quite flat at this stage. The propulsive surface continues to be the hand/forearm almost at a right angle to the line of progress. The right arm is carried directly in front to minimize frontal resistance although frictional (surface) resistance is increased. The right leg begins to kick. The head is stable looking slightly forward. Frame #9: The left arm still develops propulsive forces backward with the hand/forearm surface. Adduction of the left upper arm is almost complete. Most of the hand/forearm has moved under the body. The right leg kicks to counter-balance the change of the left arm propulsion to extension and rotation at the elbow. The right arm continues forward. The swimmer's streamline is still maintained. Frame #10: In this, and the two previous frames, it is possible to see the high efficiency of Ian Thorpe's left arm pull. His hand/forearm is almost fixed in the water for it has moved little relative to the lane markers. This indicates that his body is being propelled past a stationary arm, a concept often lost in today's misdirected coaching, but characteristic of many great swimmers. The hips have continued to rotate which allows extension of the left arm to continue under and close to the mid-line of the swimmer. There is little lateral force component in this part of the propulsive phase of the stroke. The right leg completes its kick and the left leg is raised preparatory to kicking. Excellent streamline is seen in this frame as it extends from the fingers of the right hand to the toes of the right foot. Frame #11: The propulsive left arm is completing its extension and beginning to round-out. The right wrist begins to flex as right arm propulsion begins. It is not being re-positioned, as was the left arm after entry. The left leg begins to kick to counter-balance forces created by the right arm. Frame #12: The left hand exits the water. The left arm has been in the water since Frame #1, a period of 1.1 seconds. This illustrates quick recovery and long-propulsion, factors associated with Grant Hackett and this swimmer. The right arm continues a mainly downward press. Some of the forces created by the right arm are used to counter-balance the vertical force component of the recovering left arm. The left leg completes its kick. Streamline is maintained effectively. Frame #13: Downward and partly backward propulsive forces continue to be developed by the right arm. The silhouette of the recovering left arm is discernable and illustrates how the right arm is counter-balancing the vertical forces created by the left arm. The right leg begins to kick. Frame #14: The right arm has changed its orientation and is now creating considerable backward force. The right elbow angle has increased making the force application more direct as well as increasing the power of right arm propulsion. Right arm propulsive forces stem mainly from upper arm adduction. The left arm recovery is accelerating. The right leg kicks to counter-balance some lateral forces created by both the propulsive and recovery arm movements. Frame #15: Right arm propulsion continues with upper arm adduction producing most of the movement. The somewhat-abbreviated right leg kick nears completion. The recovering left arm is stretched forward over the water preparing to enter. The hips and shoulders have commenced rolling to a flatter alignment. Frame #16: This frame is almost a replication of frame #1. Propulsion through upper right arm adduction continues. The hand/forearm surface, which is oriented almost at a right angle to the line of progress, creates most of the drag force component of propulsion. The upper left arm has just broken the water surface as the entry commences. The position of the right foot has broken streamline to partly counter-balance the left arm entry. Some of the right arm pull is also used to counter-balance the left arm entry. Frame #17: The stroke cycle recommences. 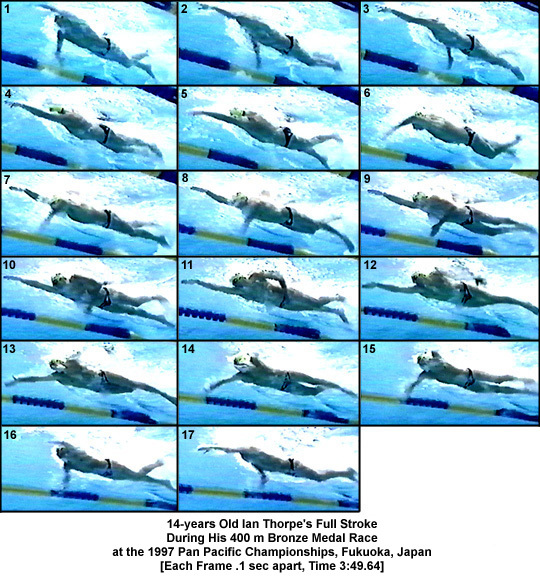 Ian Thorpe's stroke demonstrates a six-beat kick for each complete stroke. Because of the length of time that an arm is underwater, time is available to perform that number of kicks. A kick is performed to counter-balance each arm entry and exit. Since a large part of both arm propulsive phases is executed with the other arm extended forward, a considerable part of the latter half of force generation is conducted mainly with internal rotator muscles of the shoulder, lower arm rotators, and elbow extensors. This is occasioned by relatively flat shoulders. Time will tell if this specific localization of effort will prove to be troublesome. Several facets of this stroke are worthy of emulation or adaptation. A major strength of Ian Thorpe's stroke is the length of time spent generating direct forces. His left arm movement is brilliant, his streamlining superb, and his potential unknown. With maturation, this individual should re-write the record books.